Today, we are going to talk about Lutris, an open source gaming platform that allows you to install, remove, configure, launch and manage your games on Linux operating system. 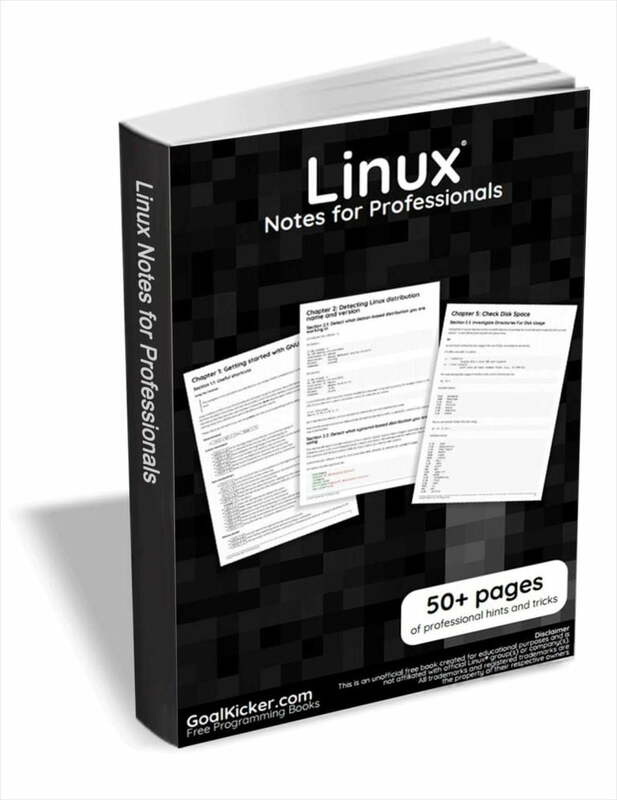 It helps you to manage your Linux games, Windows games, emulated console games and browser games, in a single interface. It also includes community-written installer scripts to make a game’s installation process a lot easier. Like Steam, Lutris consists of two parts; the website and the client application. From the website you can browse for the available games, add your favorite games to your personal library and install them using the installation link. First, let us install Lutris client. It currently supports Arch Linux, Debian, Fedora, Gentoo, openSUSE, and Ubuntu. For Arch Linux and its derivatives like Antergos, Manjaro Linux, it is available in the [Community] repository. So you can install it using Pacman as show below. sudo sh -c "echo 'deb http://download.opensuse.org/repositories/home:/strycore/xUbuntu_18.10/ /' > /etc/apt/sources.list.d/home:strycore.list"
sudo sh -c "echo 'deb http://download.opensuse.org/repositories/home:/strycore/xUbuntu_18.04/ /' > /etc/apt/sources.list.d/home:strycore.list"
sudo sh -c "echo 'deb http://download.opensuse.org/repositories/home:/strycore/xUbuntu_17.10/ /' > /etc/apt/sources.list.d/home:strycore.list"
sudo sh -c "echo 'deb http://download.opensuse.org/repositories/home:/strycore/xUbuntu_16.04/ /' > /etc/apt/sources.list.d/lutris.list"
For other platforms, refer the Lutris download link. Once installed, open Lutris from your Menu or Application launcher. At first launch, the default interface of Lutris will look like below. Next, you need to connect your Lutris.net account to your client in-order to sync the games from your personal library. To do so, register a new account if you don’t have one already. Then, click on “Connecting to your Lutirs.net account to sync your library” link in the Lutris client. Enter your user credentials and click Connect. Now you’re connected to your Lutris.net account. 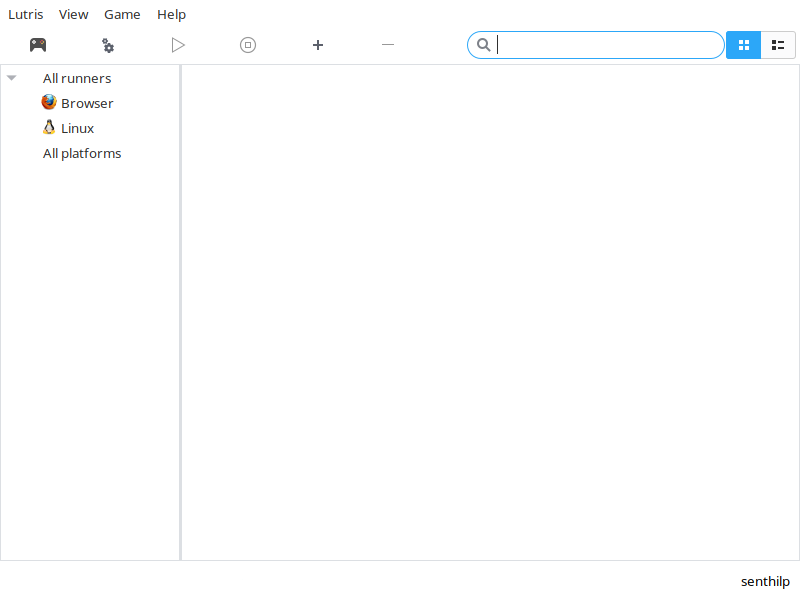 To search any games, click on the Browse icon (the game controller icon) in the tool bar. It will automatically take you to Games page of Lutris website. You can see there all available games in an alphabetical order. Lutris website has a lot of games and more games are being added constantly. Choose any games of your choice and add them to your library. Then, go back to your Lutris client and click Menu -> Lutris -> Synchronize library. Now you will see all games in your library in your local Lutris client interface. If you don’t see the games, just restart Lutris client once. To install a game, just right click on it and click Install button. 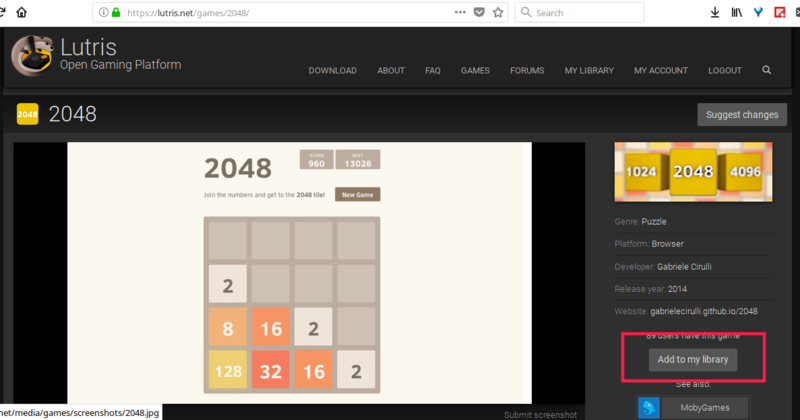 For example, I am going to install 2048 game in my system. 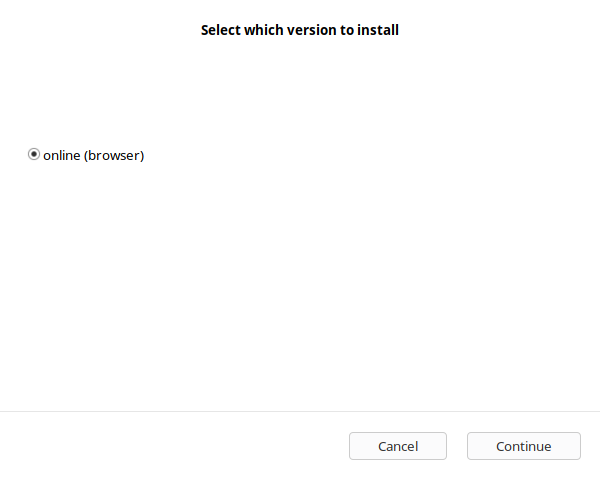 As you see in the below screenshot, it asks me to choose the version to install. Since it has only one version (i.e online), it was selected automatically. Click Continue. After installation completed, you can either launch the newly installed game or simply close the window and continue installing other games in your library. You can also import your Steam library. To do so, go to your Lutris profile and click the “Sign in through Steam” button. You will then be redirected to Steam and asked to enter your user credentials. Once you authorized it, your Steam account will be connected with your Lutris account. Please be mindful that your Steam account should be public in order to sync the games from the library. You can switch it back to private after the sync is completed. Lutris has an option to add games manually. To do so, click the plus (+) sign on the toolbar. In the next window, enter the game’s name, and choose the runners in the Game info tab. The runners are programs such as Wine, Steam for linux etc., that helps you to launch a game. You can install runners from Menu -> Manage runners. Then go to the next tab and choose Game’s main executable or ISO. Finally click Save. The good thing is you can add multiple version of same games. To remove any installed game, just right click on it in the local library of your Lutris client application. Choose “Remove” and then “Apply”. Lutris is just like Steam. Add the games to your library in the website and the client will install them for you! And, that’s all for today, folks! We will be posting more good and useful stuffs in the days to come. Stay tuned! i don’t use paypal;what other way to donate. trying to setup a box for my son on ubuntu.